Consumers can do it for sandwiches and pizza, so why not order an iPhone 5 online and pick it up at an Apple Store when it's ready? 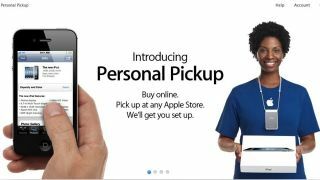 Apple launched a new "Personal Pickup" service Monday, letting customers put in an order for whichever flavor of iPhone 5 they prefer (black/white, 16GB, 32GB, or 64GB) starting at 10 p.m. EDT. The service isn't just limited to the newest iOS handset - all Apple products, including all iPhones, iPads, and iPods appear to be up for order, according to Apple's website. From Monday night on, orders can be placed nightly from 10 p.m. until 4 a.m. through the Apple Online Store or, for iPhones and iPod touches, through the Apple Store app. Apple touts its new ordering service as letting customers check availability before they trek down to an Apple retail store, saving precious time and patience. For in-stock items, some orders can be filled in as little as one hour. Customers can choose which Apple Store they visit and in some cases can have a family member or friend pickup the item for them. Apple is also offering "Personal Setup" with the service, giving one-on-one intros with devices upon pickup. Personal engraving for new iPad and iPod orders and custom gift wrap are also Personal Pickup perks. Best of all, iPhone 5 customers get first-dibs on phones coming into the store, just as a reservation system allows. Then, they'll have up to two picks to get down to the store to pickup the device. Last but not least, should a Personal Pickup customer want to return an item purchased through the service, they can do so by mail or at any Apple Store location.